Step Up Oklahoma supporters attended a Feb. 12 rally to support the plan before it failed a vote in the state House of Representatives later that day. Step Up Oklahoma, which billed itself as a grassroots coalition of business and civic groups, rolled out its plan in early January. By the time a key House vote occurred almost six weeks later, the organization, operating as a private company with unknown owners, had bought or enabled television and radio ads, robo-calls, mailers, endorsements, one-to-one outreach, and the deployment of registered lobbyists of supporting companies. A top public-relations firm was hired to coordinate the Step Up campaign in support of an array of bills, including House Bill 1033xx, which contained most of the proposed new taxes. In the end, that measure failed to clear the three-fourths majority in the House required to raise taxes. But the campaign left a strong impression, drawing public support from more than 40 organizations. Left unknown about Step Up and opposing groups was how much was spent and where the money came from. The reason is a gap in transparency requirements in Oklahoma ethics laws: Although disclosure of sources and amounts of money spent are typically required when groups directly try to influence the election of candidates and votes on state ballot questions, little must be disclosed when a group or business tries to influence legislation. The exception is activity by registered lobbyists, but even that disclosure is limited, and Step Up’s and its opponents’ efforts are not considered lobbying under state law. The Step Up model, which used a limited liability company of the same name devoted to the cause, could prove a model for future efforts to push or oppose legislation. Federal broadcast regulations offer one of the few places to check the disclosures of groups like Step Up, and that’s only if they buy advertising on local TV or radio. But the information disclosed is often not comprehensive. Step Up representatives declined to disclose the total amount of the group’s advertising budget. Based on political broadcast disclosures, Oklahoma Watch was able to identify at least $27,000 in advertising on three TV stations and four radio stations. That doesn’t include advertising at News on 6 in Tulsa and News 9 in Oklahoma City. On public disclosure forms, those stations redact the amounts spent on local political issues; most other broadcast stations leave those amounts on public filings. It also doesn’t include ads in newspapers, digital ads or billboards. The Federal Communications Commission requires broadcast companies to disclose political-ad buyers but not the amounts spent unless the issues have a national scope. At least three other groups weighed in on the Step Up effort or higher taxes with a form of advertising. The wind industry’s local group, OK Wind Power, said it spent more than $220,000 on a public education campaign in recent weeks that didn’t mention candidates or legislation. Sheila Curley, whose Tulsa public relations firm, sixPR, handled the OK Wind Power effort, said the pro-wind advertising was spent mostly on TV and print ads, with a small portion on radio and digital ads. She said the effort is ongoing. “These ads are part of a comprehensive public education campaign to showcase the economic benefits of the wind industry to rural communities, school districts and landowners,” Curley said in an email. Another group, No New Oklahoma Taxes, formed in mid-January and spent about $51,000 on ESPN and Fox News Channel advertising in the Oklahoma City and Tulsa cable TV markets, according to political advertising disclosures required by the FCC. It spent at least $10,000 on radio ads. The anti-tax group’s officers include Monica Wilke and John Collison, who worked at the Oklahoma Farm Bureau until last summer. In an email, Collison didn’t disclose the group’s funding sources. He emphasized its grassroots representation and the ever-changing tax burden on businesses and individuals. No New Oklahoma Taxes is a 501(c)(4), or “social welfare” nonprofit and, unlike Step Up Oklahoma, generally may spend no more than half its money on politics. Another social welfare nonprofit, the Oklahoma chapter of Americans for Prosperity, focused its recent advertising against tax increases on digital ads on Twitter and Facebook. The group typically doesn’t disclose its social media or advertising budget. John Tidwell, director of the group’s Oklahoma chapter, said defeat of the Step Up plan was a victory for taxpayers, especially low-income families. He said Americans for Prosperity was also encouraged by budget reform efforts pushed by some lawmakers, including Medicaid audits. Even though Step Up, No New Oklahoma Taxes and Americans for Prosperity promoted or opposed a specific tax plan that eventually led to the bill that failed in the House, their efforts are not considered lobbying under state law. The IRS requires nonprofits to offset lobbying spending with educational efforts. No requirement exists for limited liability companies such as Step Up Oklahoma. Step Up Oklahoma supporters write on an Oklahoma Education Association board about why they support the plan. Outside of advertising, it is also unknown how much was spent by groups for or against the Step Up plan on public relations, marketing, supplies and other logistics. 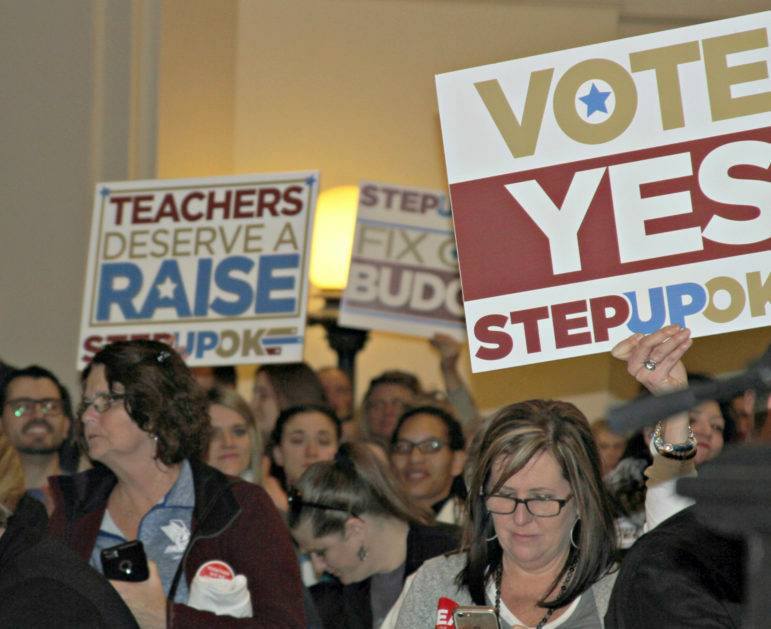 What was spent, for example, on an effort to bring hundreds of educators and Step Up Oklahoma supporters to a rally at the State Capitol before the vote on HB 1033xx? Many of the participants, wearing Oklahoma Education Association, “Vote Yes” or Step Up Oklahoma T-shirts, arrived in red-and-white charter buses, similar to the ones that brought in energy industry employees when they protested a gross production tax increase last year. 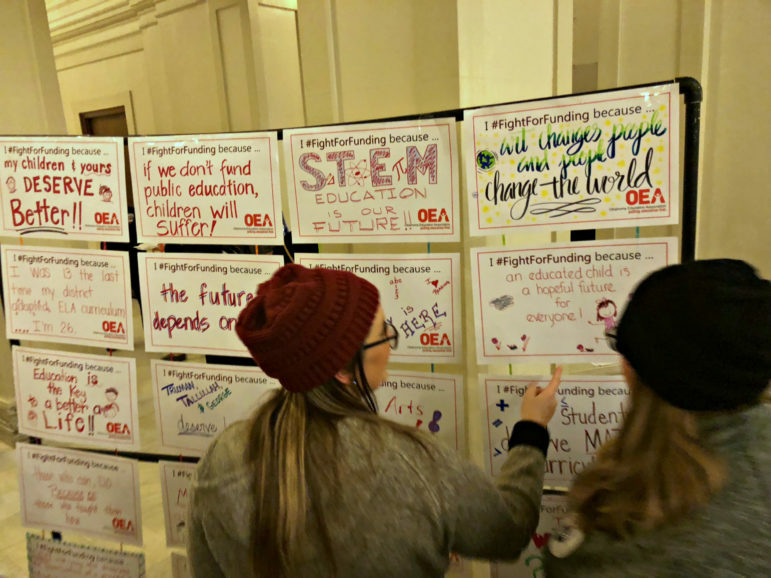 Doug Folks, a spokesman for the Oklahoma Education Association, said his group only encouraged its members and worked with administrators to attend the event. He said OEA didn’t pay for any of the transportation and allowed local communities to determine how to get their people to the Capitol. Folks added that he heard Step Up Oklahoma coalition members provided some of the buses and resources to transport supporters, but he didn’t have specifics on costs or who paid for what. Step Up Oklahoma supporters react to the apparent failure of the plan during a Feb. 12 vote in the state House of Representatives. Oklahoma Ethics Commission rules require disclosure or impose restrictions on a wide range of expenses by groups or individuals trying to influence political races or state questions. But Oklahoma political-spending law is largely silent when it comes to money spent on issues or proposed legislation, such as the Step Up tax plan or those fighting it. That is also the case in other states. Because this type of spending does not “refer to a clearly identified candidate” nor is directed at “supporting or opposing a state question,” it doesn’t meet two of the main triggers requiring disclosure for electioneering communications or independent expenditures. Electioneering communications are those coming 30 days before a primary or 60 days before a general election that mention a specific candidate. Independent expenditures are any political spending that isn’t coordinated with a campaign. A limited liability company, such as Step Up Oklahoma, that spends money outside of an election has no obligation to list its donors or report spending data. Anyone can create an LLC by paying $100 to the Secretary of State and filing articles of organization. No information is required beyond the name and address of the registered agent, who often works for a law firm that files many incorporation papers. LLCs do not pay corporate income taxes; rather their profits and losses typically are reported on the owners’ personal income tax forms. The owner or owners of Step Up Oklahoma have not been disclosed. In contrast, nonprofit organizations with federal tax-exempt status, such as No New Oklahoma Taxes, are required to report spending information under general categories as well as other details on their tax returns. Such groups must provide donor information to the IRS, but it’s allowed to be kept secret on the organization’s public tax filings. And since the IRS requires the disclosure on an annual basis, there is often a lag time of up to nearly two years between the time the spending occurred and when it becomes publicly disclosed through the IRS. Oklahoma’s lobbying rules also shed little light on what groups for or against the Step Up plan spent on the effort. Individuals must register as lobbyists if they spend money directly on legislators – meals, sporting event tickets, etc. – or work for a “lobbyist principal” who pays them to influence specific legislation. Promoting legislation as an individual or groups of individuals is protected speech under the First Amendment. 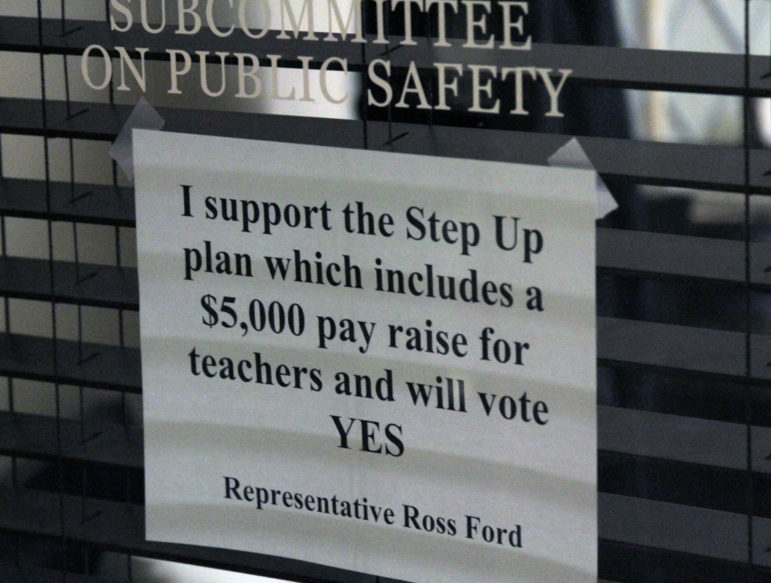 A sign on the door of Rep. Ross Ford, R-Broken Arrow, announces his support of the Step Up Oklahoma Plan. Most of the companies or associations listed as part of the Step Up coalition supporters employ their own paid lobbyists at the Capitol. But Oklahoma law doesn’t require lobbyists to detail how much time or effort they devote to each client. Unlike some other states, Oklahoma doesn’t require lobbyists to reveal what bill or topic they are discussing when they buy a meal for a state official. Lobbyists, who sometimes have more than dozen clients, also don’t have to list what specific client they are representing when they buy a meal or a gift. Any information connecting lobbyists to gifts or meals in the immediate build-up to the Step Up tax vote won’t be known until March 5 – the deadline for lobbyists to list their February spending totals. 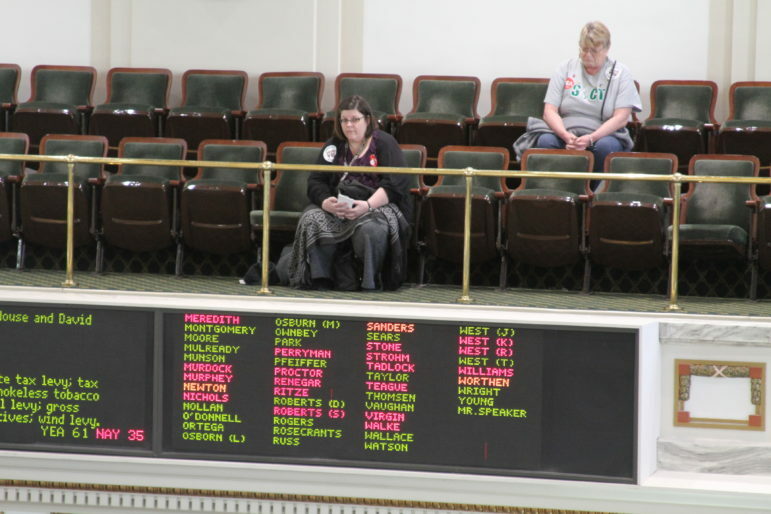 Rep. Cyndi Munson, D-Oklahoma City, who voted for the measure, said she was inundated with calls, emails and visits from supporters and opponents of the plan. Munson also said she was contacted by lobbyists and business leaders pushing the Step Up proposal, including David Rainbolt, executive chairman of BancFirst Corp and Devon co-founder Larry Nichols. Munson said many of her constituents contacted her office after reading news reports or because they follow the legislative process. Others responded after receiving direct-mail advertisements and robo-calls, including those from Step Up Oklahoma supporters. Not all lawmakers were lobbied equally. Rep. Tom Gann, R-Inola, said he saw little pressure outside of the usual residents from his district who tend to weigh in on tax proposals. Gann, who was one of the 35 no votes on the main Step Up Oklahoma revenue bill, is a member of the Legislature’s Platform Caucus – a group of fiscally conservative lawmakers who have routinely opposed tax increases. As a result, he said, no lobbyists or Step Up Oklahoma coalition members even tried to win him over. And he said only about 25 percent of the constituents he heard directly from told him to vote for the plan.